The Wireless 3-Axis Acceleration/Altimeter measuring acceleration in all three dimensions as well as altitude making in useful for a wide variety of activities and experiments. The 3-Axis Acceleration/Altimeter includes a strap so that students can collect data during any number of physical activities without cables getting in the way. The sensor is surrounded by a rubberized case that protects it from impact. The 3-Axis Acceleration/Altimeter can also remotely log acceleration and altitude data, making it ideal for recording the motion of roller coasters or other rides. No need for an interface. 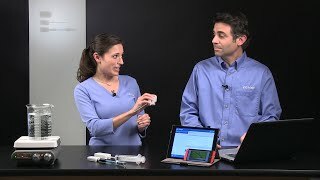 All PASCO Wireless Sensors connect to computers, Chromebooks, and tablets, through Bluetooth 4. No other equipment required! Our software (SPARKvue or PASCO Capstone) allows students to see and analyze data in real time. The Wireless Acceleration/Altimeter draws as little current as possible. This provides you with long battery life for lab activities. Our software also displays the battery level at all times. If it dips too low, you can easily replace the coin cell battery.